Vegetarian Taco Wraps are a simple, kid-friendly lunch. Packed with protein from black beans and Mexican flavours, this recipe will become a favourite. I’m always trying to incorporate more vegetarian meals into my diet. You might remember, a couple of years ago I tried to do the Meatless Monday thing but I found that sticking to a precise schedule was a challenge. I ended up giving up on that, which still disappoints me to this day because I’m not the type of person who gives up on things easily. I’ve found that having vegetarian meals here and there throughout the week works better for me. It leaves more room for spontaneity. The protein from the beans is a nice protein and energy boost to keep you going throughout the afternoon. I find that these wraps make a great lunch option but are also a great idea for a fast dinner. I’m almost positive that you have all these ingredients in your fridge and pantry right now, so why not whip these up for dinner? 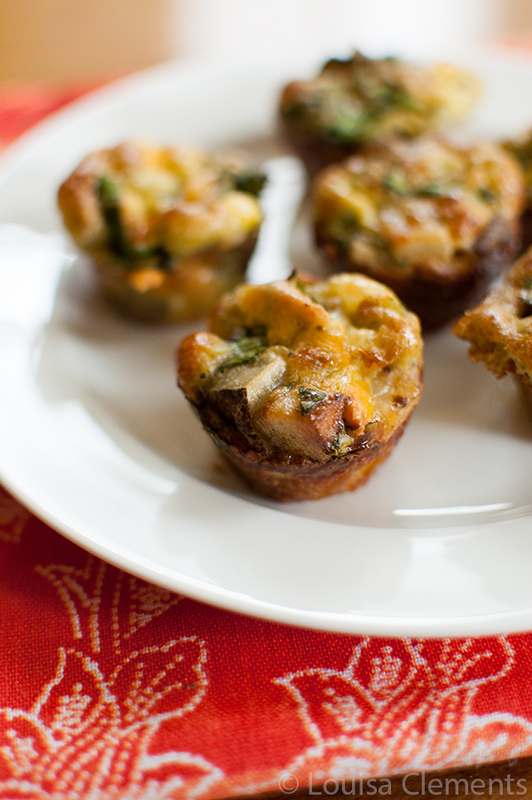 Mini pesto potato spinach frittatas are filling, protein packed and bite-sized. I like to pack these for lunch or breakfast on-the-go because they are easy to eat (in the car, of course). 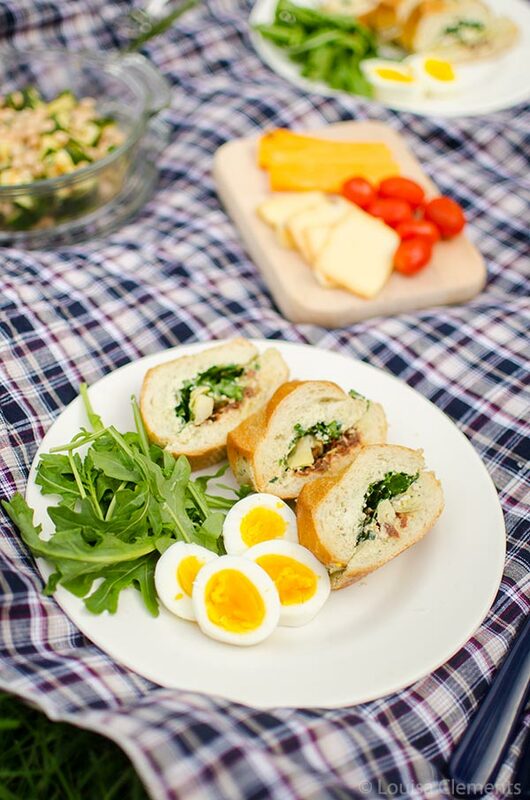 Antipasto Loaf is a vegetarian sandwich that can be prepped the night before. If you’re like me and constantly on the go, a protein-packed lunch is essential and these three recipes are great choices. 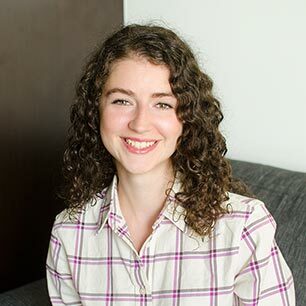 I also love to make them for lunches because they can be prepared the night before and are still just as good the next day (if not better), especially the antipasto loaf–that sandwich will change your sandwich game forever. Guaranteed. 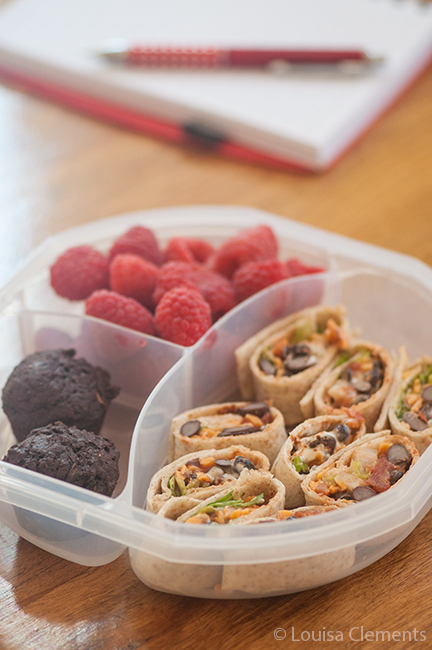 A simple, protein packed wrap perfect for a school or work lunch. Mix black beans with chili powder and cumin. To make 4 wraps, layer each wrap evenly with black beans followed by salsa and sour cream. Sprinkle with grated cheese and romaine leaves. Wrap tightly and slice into bite-sized pieces or leave whole. These Vegetarian Taco Wraps make a delicious lunch or fast dinner. Have you thought about getting bento boxes for these taco wraps and side dishes? I love bento boxes, it's so cute! These grain mini tortillas are sooooo cute! I have definitely thought about getting bento boxes but haven't gotten any yet - will have to check them out next time I'm at the store! Sounds really interesting! I think I will try them for lunch!